When we hear of news stories around the globe or in our own neighborhoods, it can sometimes be troubling. We may become aware of happenings in our own extended or immediate families. As we ask ourselves, "Why? Why would they make that decision?" one possible answer might be "Because they do not know what they should do." As we seek wisdom from the Bible, prayer, study groups and services, we are priviledged to have the opportunity to learn about God’s best choices for our lives. Others may not have ever understood that this was available to them, or perhaps, they have become drawn away from the truth. 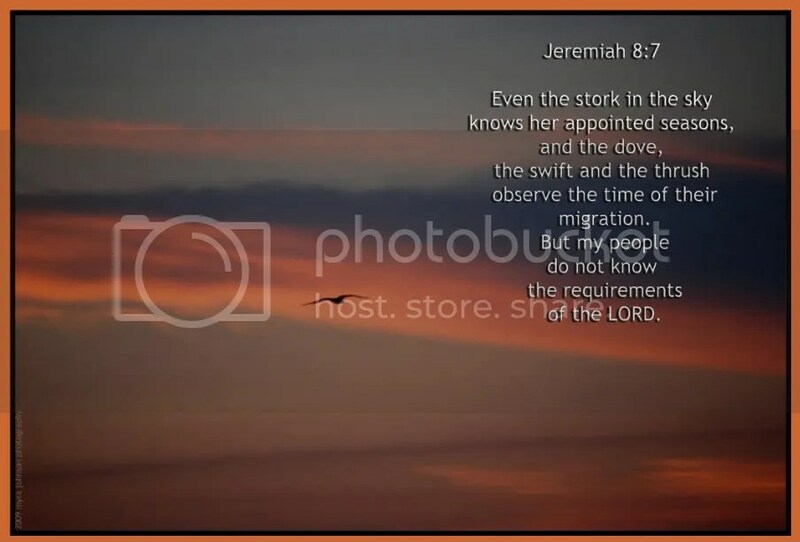 Jeremiah 8:7 says, "Even the stork in the sky knows her apointed seasons, and the dove, the swift and the thrush observe the time of their migration. But my people do not know the requirements of the LORD." What could I be doing to help others know God’s best? Yes…so often I see and hear people obviously at a loss for the right direction and obviously not understanding God’s Word…I so want to impart to them some truths from It! How much so our God must want us to sit at His feet and learn of Him! Within an hour or so, I knew that something was different. Strength was leaving and cold chills began to come over me.